Sydney Fish Market is set for major redevelopment in a bid to become a tourism destination in its own right, with work set to start before Christmas to shift the market to a new home. The NSW government has unveiled plans for a significant redesign of Blackwattle Bay. Work will entail moving heavy industry and opening new inner-city homes and shops. It’s all set to be completed by 2023 – if work keeps to schedule. Described by the Tourism & Transport Forum as “the largest market of its kind in the Southern Hemisphere”, the market has long been a Sydney icon. Its new incarnation is a lot sleeker than the current version, with a clean, fresh look like the seafood it will sell. Patrons can look forward to the appetising aroma of fresh seafood, available in abundance. The Tourism & Transport Forum has for years championed the redevelopment of the Sydney Fish Market. It’s chief executive, Margy Osmond, welcomed the New South Wales government’s decision to redevelop saying that Sydney Fish Market is shaping up to be the jewel in the crown of the rejuvenated Blackwattle Bay precinct. “The renewal of Sydney’s western harbours will be a fantastic addition to what Sydney already has to offer, not just for locals but also for our growing international visitor market,” she said. 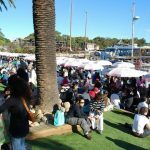 “And in a sign of the Sydney Fish Market’s growing international appeal, of the 3 million annual visitors to the tourism hotspot, almost a third (900,000) are international tourists. “With more than 700,000 Chinese visitors to Sydney last year, over half of them visited the Sydney Fish Market, an extraordinary indication of demand to experience Australia’s fresh seafood on site. “More public spaces, boardwalks and dining options will build on the existing visitor infrastructure onsite, which currently includes seafood retailers, a bottle shop, greengrocer, bakery, butcher, sushi bar, restaurants, gift shop and gourmet deli,” Osmond said. 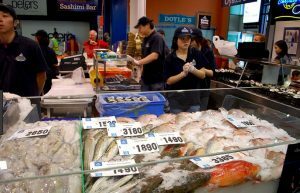 A working fish market, Sydney Fish Market employs approximately 65 staff to organise the weekday wholesale auction, promoting Sydney Fish Market as the centre of seafood excellence. 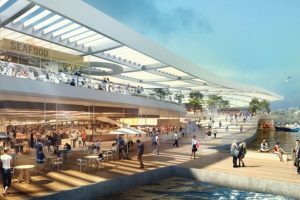 “Sydney Fish Market will be a place for workers, locals and visitors – with opportunities to interact with the water, learn about fish and the sea, hold public events or enjoy take-away fish and chips with family and friends,” Osmond said.